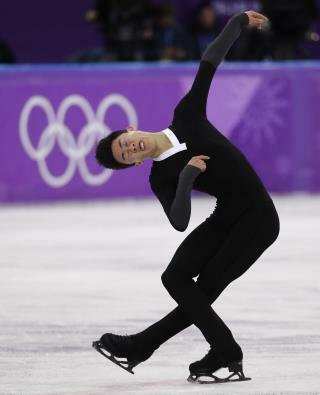 (Newser) – Nathan Chen finally admitted the pressure of being the face of American figure skating got to him, winding him up so tight for his short program that it ended in what he described as a "disaster." All that pressure was gone for his free skate. Out of medals contention and finally skating with a clear mind, the 18-year-old prodigy landed an unparalleled six quadruple jumps in a historic performance at the Pyeongchang Olympics. (You can watch some of them here.) His personal-best score of 215.08 points Saturday was more than enough to win the free skate, and helped move him up to fifth place, reports the AP. Going into the night he had been in 17th place out of 24 skaters. Yuzuru Hanyu and Shoma Uno took the gold and the silver medals for Japan. He failed to land a single clean jump in the individual competition Friday, and joked that he would have gone straight to the practice ice if there was any availability, but instead he retired to his room. He lay on his bed and allowed his mind to go blank, save for the almost preposterous of idea of trying to shoehorn that sixth quad into his program. Performing to "Mao's Last Dancer," the two-time US champion ripped off a quad lutz to start his program, then landed a quad flip-double toe combination before another quad flip. That third one was originally supposed to be a triple loop. After achieving level-four ratings on his spin and step sequence, the high-flying Chen landed a massive quad toe-triple toe combination before another quad toe and a quad salchow. That's six quads in four variations, something never before accomplished in any competition. How in the hell did I miss the men's free skate? I'll find it somewhere on the internet. Damn. Wow, he's setting himself up for a career with Disney on Ice. Wow. That's all I can say is WOW!